We get many questions every month regarding raccoons and the process of trapping and removing raccoons from home, attic, buildings and other places where raccoons become a nuisance to humans. What we have bellow is a common list of questions that is most frequently asked via email or to one of our technicians out in the field. Remember this list of raccoon FAQ’s will be a ongoing piece of work so check back often as the page will often change! How do I get rid of raccoons in my attic? How many babies do raccoons have at a time? Are Raccoons easy to trap? How much do raccoons weigh? What damages do raccoons do to your attic? Do raccoons dig in my yard? What do you do with raccoons after they are trapped? Can I keep a raccoon as a pet? Are raccoons aggressive to people and pets? If you feel you need a professional animal removal expert and live in the united states you can go to our animal removal expert page and choose the state and city in which you live to find a reputable raccoon removal professional. Q: How do I get rid of raccoons in my attic? A: How do I get rid of raccoons in my attic is a common question that requires a bunch of different answers. You could always trap the raccoon Then you are faced on what to do with the raccoon after trapping it. 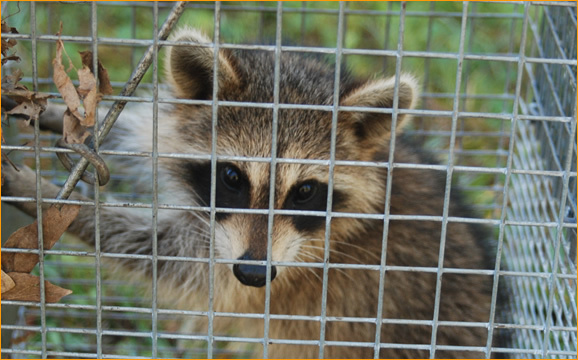 In many states a raccoon is considered a rabies carrier and it is illeagal to trap and release a possible rabies carrier unless released on your own property. If you release it on your own property, did you really solve your problem? The best way to handle this is to call a professional from our list. They can offer you a complete solution to your, raccoon in the attic problem. Q: How many babies do raccoons have at a time? A: How many babies will a raccoon have at a time is a hard question to answer, There is many factors that play into how many babies a raccoon will have. One is the holding capacity of the current population that the area is capable of holding; mother nature has a unique way of controlling this and is fairly good at it. The second is the abundance of food. If food is scarce, then the birth population will be down considerably compared to a good food year. So the answer is, It depends. Q: How Long Do Raccoons live? A: How long do raccoons live is a question that we receive in all times of the year from may different people. Raccoons can live in the wild for betwen 8 and 10 years, However we have gheard of documented cases where raccons in capitivity have live up to 20 years. This is a extermely long time and the life span of a raccoon really depends on its diet. Raccoons will live longer in the wild where they only eat natural foods. Compared to a urban enviroment where they are exposed to human foods from trash cans and other sources such as dumpsters. Q: Are raccoons easy to trap? A:Are raccoons easy to trap is a question that is asked a lot of times by homeowners that are looking to possibly trap their own raccoons in traps that they possibly buy from home depot or Lowes. Raccoons can be tricky to catch in a live trap. Raccoons are finicky eaters and we only commit to a trap that has the correct bait inside it. With the right bait source changing from different parts of the country. One thing you can bet is you will have better luck with natural types of bait as opposed to hot dogs and other unnatural foods. Q: How much do raccoons weigh? Q: What Damages do raccoons do to your attic? A: What damages do raccoons do your attic depends totally on how long the raccoons are allowed to stay up in the attic area of your home. Raccoons will not do a lot of damage if they are removed as soon as they are discovered. If the raccoons are allowed to stay in the attic area of a home they will do much damage to duct work from your AC unit and they will urinate and defecate in your insulation. This will essentially ruin your insulation and possibly your sheetrock on your ceiling. These materials become saturated with urine and this will cause damage that is irreversible. When these items become damaged, they must be cleaned up and replace. Q: Do raccoons dig in my yard? A: Do raccoons dig in my yard is often a question that is asked by homeowners that had a very large disturbance in their yard. Raccoons will gain access in yards to dig for grubs and other insects that are found underground in your yard. The drawback about just applying a insecticide is the insects that the raccoons are after is some of the same insects that make your yard healthy and lush. One of these insects is Japanese Beatles. The other thing the raccoon could be eating out of your yard is earth worms. Both of these yard inhabitants are a common food for raccoons that are digging in your yard. Q: What do raccoons eat? Q: What does someone do with raccoons after they are trapped? A:What does someone do with a raccoon once they are trapped is a very difficult question to answer, the short easy answer is: Do what the state law says you do with it. Many states have many different rules and regulations and have very stiff penalties if you violate their regulations. Many states such as Virginia and Maryland require that if you catch a raccoon in a trap, then it must be humanely put down. Other states such as Florida allow you to relocate the raccoons to areas that allow such relocation. So it depends on where you are located. The other part of this answer is. Do you know how to release a aggressive raccoon from a trap? These animals are VERY aggressive when they are trapped. Do you want to reach down and open the cage and let a aggressive animal pass within 6 inches of your hand? Raccoons have been known to turn around and attack once released. You should skip this if you are inexperienced. Call a professional from our trappers list located on top of this page. Q: Can I keep a raccoon as a pet? A: If you can keep a raccoon as a pet depends on what state you are in. It is illegal to keep a wild born raccoon in any state in the union however some states allow toy to keep domesticated raccoons. You will have to check with you state office to see if this is possible. However I will tell you that keeping a raccoon as a pet is not a good idea. As young raccoons they are cute a cuddly, however they do get bigger and with age comes their wild ways and instincts It would be totally unnatural for a raccoon to be handled. Many people think that they can teach a raccoon to be tame, this would be like teaching a bird not to fly, this will not happen. These are wild animals and will always be wild. Never try to domesticate a wild raccoon.